When I was growing up, there were few ways to spark joy in the hearts of children, more easily than having us see that big, black metal cart, holding a television and VCR rolling through the door of the classroom in school. It’s probably different now, with projection systems, and streaming services, but nothing could make my heart leap back then quite as well as that sight. It meant we were in for an easy day. A “movie day”. Sure, there were times when whatever we were watching was related to whatever we were studying in school – some documentary. 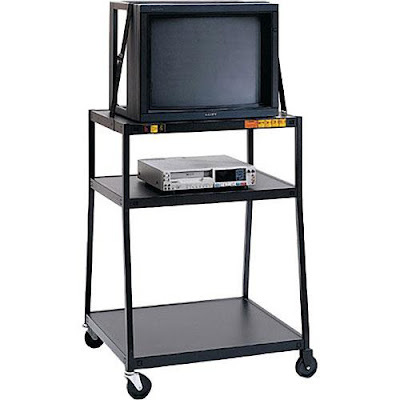 But on “movie day” – even if it was just a boring “learning” movie – on “movie day” we could sit back, and just watch. There was no chance of being called on when you didn’t know the answer. There was no chance of a pop quiz. And no listening to that same voice we heard every other day prattling on… On “movie day” we were free, even if we were still in class. But then, a few years later, a whole series of movies would come out on the same theme: Back to the Future. In the series, Marty McFly befriends the local town genius-slash-nutjob, Dr. Emmett Brown – or, “Doc” as Marty calls him. Doc had invented a time machine, and built it into a sports car. By fidgeting with the dial on the dash board, Marty and Doc could tell the car to take them anywhere in time. And they travel through time in their little town, trying to escape trouble and correct mistakes they make along the way. There are a couple of reasons why films about time travel seem to have such staying power – why they tend to resonate again and again. When it comes to traveling into the future, it satisfies our curiosity (at least in the world of our fantasy) of knowing what to expect. But when it comes to traveling into the past, in addition to satisfying our curiosity about what really came before us, beyond just what others have reported – it also makes space for a second chance. It indulges the fantasy of correcting our mistakes. Taking a do-over. It is a wild and precious life. And what we do with it is important. How we use it, and who we use it on – these are the things that define a life. And we just get this one. There are no do-overs. But there is grace. There is the love of God. And no matter how we’ve used our life, through the love and grace of God, there is a chance at something more. This parable of the fig tree is sort of harsh to hear. It begins with followers coming to Jesus and telling him about the great atrocities they’ve learned about in Jerusalem – the place where he, himself, intended to go. They were warning him about the danger he faced if he kept going down that same path. People like him – people trying to live their faith more fully – were paying with their lives. Pilate had cause their blood to be “mingled with their sacrifices” – which is just a poetic way of saying that he had killed them while they were offering their sacrifices to God. And, of course, that’s exactly what happened. Like the story of Moses: he was a boy with not much to offer. He had run from his people. He had failed to meet his potential. But God kept calling. God met him in the wilderness, and spoke to him through that now-fabled burning bush. God convinced him that he could be more. He had more chances still living inside him. Second chances are the stuff of fantasy in movies, but they are commonplace reality in a life in Christ. Through all of our failings and fears and falling short, even in the midst of all that, there is grace. There is one more season to try to get it right. There is one more effort at helping us to hear the call. At convincing us that we are, actually, good enough to do all that God is calling us to do. Even when we run, there is grace. Even when we fail, there is grace. It may not be like traveling through time to fix what went wrong before, but it’s actually better. It’s a second chance that doesn’t change history, but still changes the world. Lent is about that second chance. About getting the chance to experience the world in expectation of grace. About holding on to all that’s holding us back, and finally learning to let it go, so there’s room for the grace – the second chance – that’s been promised. By all accounts the fig tree should have been cut down. Moses should have been forgotten. God could have moved on. But instead, another chance came by the grace of God. And it will for us, too. It does. It’s happening right now. We may not think we have much to offer, but God sees the best in us, and is holding out for all that we have in store. And there’s grace enough to get us there. Amen.